The WORST Hitting Drill for Baseball or Softball EXPOSED! Many players are getting ready for tryouts at their high schools and some are doing 'preseason' workouts for their 12 and under travel teams. I keep hearing the same complaining that some of the drills they are being forced to do are against what makes sense in the swing. Many coaches will 'isolate' the hands with top and bottom hand drills. I don't really have a problem with that in moderation as its a great strength and coordination building movement, and can be fun for kids to make games out of. Coaches will spread hitters out really wide and force wrist isolation as well with more 'speed toss' drills which consist of repetitive arm motion to swing the bat accross the chest instead of hip driven turning. We do this drill in our evaluations to see what kids 'eliminate' in their swing in order to hit the balls. Most kids take their hips out...bad idea. The best kids with the best patterns naturally keep their hips moving, and more often than not, can hit more balls in number and hit more balls hard. Coaches also do drills putting kids on one knee, again, taking all stabilization out of the swing (which makes no sense) and forces kids again to create an arms and wrist dominated move, simply because they have no other choice. How would that drill look if I add two tees with photoshop into Ryan Braun's game swing? How bout Ichiro, a hitter I never teach off of and is known for hitting SINGLES instead of powerful drives, do you think he's going to miss the high tee? 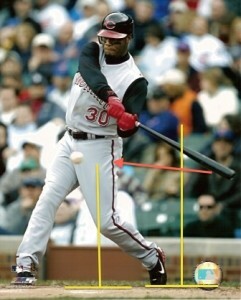 On of the best hitters of all time...destroying the High Tee/Low Tee drill in his real game swing. Do we think the professional players actual movements are incorrect or the drill? Even worse, if we now know the drill is wrong...how come this is such an accepted part of our fundamental teaching for our youngest players? The scary part about this drill and the blind following of mechanical teachings, like 'A to C' mechanics and 'swing down' mechanics, is that they're not visually supported at all in actual MLB games! Remember this clip from the 2012 world series? Really LISTEN to the announcers' voices and how they're excited about debunking the myths and finding out what really happens in the game swing of MLB players. Think about the advantages of seeing what's happening so hitters across the country can benefit from more accurate teaching and more drills that make sense. What would happen to the 'high back tee' in that swing? Honestly, it really makes me sad when I see a kid come into my building with that downward trajectory in their barrel. It makes me mad when that kid tells me he's had dozens of lessons and PAID for that information. 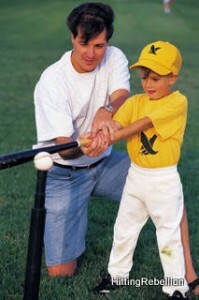 I do not expect youth coaches to be experts in the baseball or softball swing. But I do expect the ideas and drills they have the kids do to make sense. As stated in our Pitchers vs Hitters article, we know the pitcher is throwing the ball down so we must get our barrel in the way of the baseball and keep it there a long time. 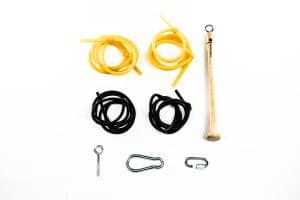 Drills that directly disallow that should not be practiced...and there is no real use for them in training purposes other than to fix a DRAMATIC uppercut and even then there are simply better ways to accomplish a better swing path.